An electric car at Walt Disney World outside of EPCOT Center? The Dapper Dans have always been known as the Ambassadors of Main Street, since their inception at Walt Disney World on September 23, 1971. In the following image from a 1976 Eyes and Ears. we meet Neel Tyree, who started as a Dan in 1973. In addition to being an Ambassador of Main Street, with his CitiCar, he’s ready to be an ambassador for the future! 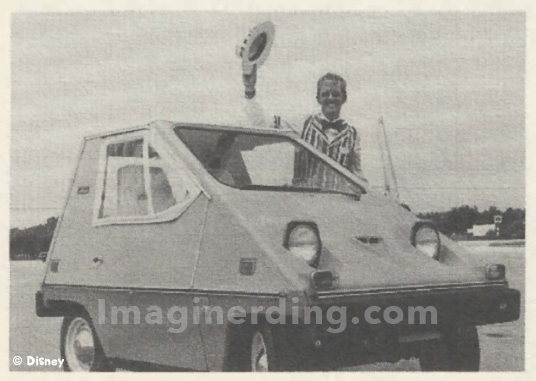 Sebring-Vanguard, located in Sebring, FL., manufactured the CitiCar, a battery-electric vehicle, from 1974-1979. The company only made 4,444 units and included several variations and models. The range was about 40 miles and depended on tire pressure, vehicle weight and whether the windows were rolled up or rolled down. So, no air conditioning? In the Central Florida heat and humidity? Do you really want an electric car at Walt Disney World?